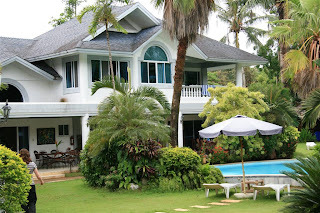 Boracay Hills is where all the magic happened. A few months before we flew to the Philippines, Krista was scouring the internet for a good place to stay on Boracay Island. She emailed dozens of places and finally came across Boracay Hills. It was going to be the rainy season so we wanted to make sure there was a pool there just incase the weather was absolutely terrible for the duration of the trip. 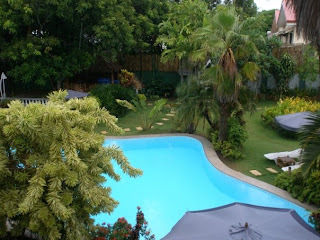 As it turns out, this place had the pool we needed for the first day and a half of rain! It was also great to have coffee by the pool every morning and a few beer there in the mid afternoon and evening.. and then there is the late dip before going to bed way past midnight. 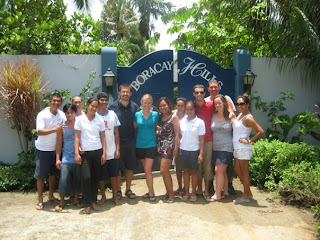 You can check out the website here or search Facebook for the group Boracay Hills Resort Vacationers. Five of us split the cost of the hotel so it ended up being a pretty good price for the experience we all had. We enjoyed a table for 5 outside on the main floor that we used for breakfast, dinner and hanging out. 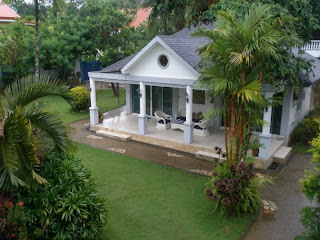 This is of the main house, we had the entire 2nd floor with the terrace. This is the guest house with a few more rooms. Behind the guest house is another two-level complex with more rooms. 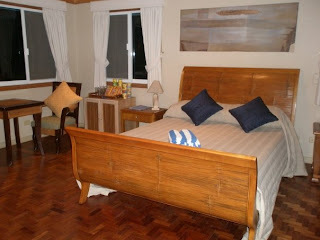 The 2nd bedroom - two single beds and one double. Pool view from the upper terrace. Krista chillin' out on the terrace. This place was absolutely wonderful and the staff were amazing! We were able to get anything and everything we wanted. 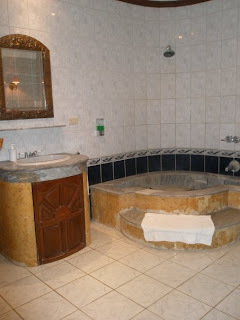 Room service, late night dinners, in room massages, manicures and pedicures. We had emailed Janes, the manager, numerous times before we arrived. She was so accommodating to everything we asked! They also had a van that would take us in to D'Mall / White Beach anytime we needed. To get back to the hotel we took a tricycle (or tuk tuk in Thailand) back to the hotel for about 20 pesos per person ($.50). One night a BBQ was organized with everyone staying at Boracay Hills, we invited all the staff as well for the drinks and dinner. This was one of the best vacations ever! We would definitely stay here again and recommend anyone thinking about Boracay Island to give this place a try even for a few nights! Mention Jon and Krista next time you book with them! Thanks again to everyone at Boracay Hills!! Great pictures especially the last group one. Wow loved your photos, you grilled all seafood and eggplant. That's good. There a good environment there, mostly in nightlife.